When I was a kid I never really liked lemon meringue pie, the meringue part anyway. I'm not exactly sure why, but normally I would just scrape it off entirely and eat the lemon filling and the crust (which I enjoyed the most). As I got older I found that I really didn't like the filling anymore either. Most lemon meringues are just too sweet. So if I'm not eating the meringue, not enjoying the filling, then I'm pretty much just eating graham crackers. But like most of my opinions, my Father's is the exact opposite, and lemon meringue happens to be his favourite. This is why sometime last year I went hunting for a lemon meringue pie that we could both agree on (a task that would make Sisyphus shudder). 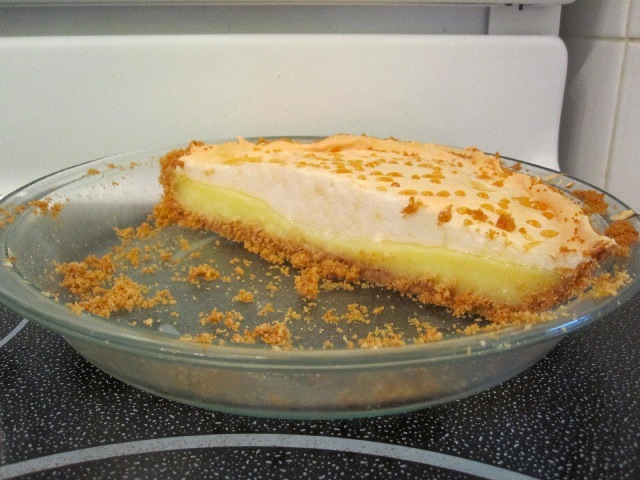 In order to achieve this I set the following guidelines: First, a graham cracker crust is required (the only real crust for this type of pie); second, a thin light layer of meringue; and third, perhaps most importantly, it cannot be too sweet. After a lot of searching, I found a recipe I thought could be the one. I made, we ate it, and it was awesome. My Father's birthday was a few weeks ago and I made sure to make his favourite pie as part of the celebration. A nice change for me was that I was actually going to make the graham cracker crust from scratch, rather than using packaged crumbs. I had a giant box of graham crackers just waiting to be used for something other than being slathered with peanut butter (mmmmm....). Yeah, I know, no big deal, all you need is a food processor; but once when I was younger I consciously put a pizza pocket in the microwave for 11 1/2 minutes instead of 1 1/2 and didn't think twice about it (true story). This was actually the third (or fourth) time I made this pie and it always turns out well. I had a slight issue with it setting the last time but it wasn't that bad and it still tasted great. However if there is one thing I have learned, it's that lemon meringue pie, above all else, is about being prepared. It's about having your ingredients ready to go because once you start making that filling there is no stopping. It's simple, but quick. The other components are even easier, although the meringue (as always) can be a bit temperamental. Mine decided to fall a bit (or a lot) this time (not sure why) but still retained the flavour I wanted (and actually like). And just so you know, yes, I will even eat an uncooked meringue out of the bowl (and it was delicious :) ). This really is the first lemon meringue pie I have ever liked, granted it might not be for you. Unlike most lemon meringue fillings, this one celebrates the lemon. It's tart like a lemon pie should be (in my opinion), not sweet. I would compare it to a good fresh lemonade. It's also thick and creamy and plays well with the light, creamy, and just slightly sugary sweet meringue. The crust is soft and buttery like a cookie, and has that wonderful honey sweetness. To put it all into perspective, the crust is actually the sweetest part of the pie, and it's just graham crackers and butter. With a pie that's made up of two types of sweet plus tartness; two types of creamy plus soft cookie, is there anything else you could want in a complete bite? I am perfectly willing to admit that you might not enjoy it as much as I do. However, if you despise the sickly sweet lemon meringues of yore, then this could be your pie too. And you know what? My Dad quite enjoys it as well. SHOCK! Now, if we could only agree that I'm always right, these situations could be avoided entirely :). Add graham cracker crumbs and butter to a medium bowl and mix until all the crumbs are moist. Add crumb mix to pie plate and press evenly on the bottom and up the sides. Using a fork, poke a few holes into the crust to prevent bubbling. Bake for 7 to 8 minutes (I left mine in for 8). Allow to cool completely on rack before using. In the medium bowl of a stand mixer fitted with whisks, add egg whites and beat on high until soft peaks form. Add vinegar and sugar and beat until stiff peaks. Add vanilla and almond extract and beat to combine. Set meringue aside until you're ready to use. Add flour, corn starch, salt and sugar into a small/medium saucepan. IMPORTANT! Have ready and next to you on the stove: egg yolks, butter, lemon juice, lemon zest and cooled pie crust. Place saucepan over medium heat and add half the boiling water, whisking until everything is combined and no lumps remain. Slowly add remaining water and continue to whisk until mixture begins to thicken. “It will go from thickened, to gravy like to runny mashed potato-ish” (great description). Whisk half of the hot mixture into the egg yolks and then transfer everything back into the saucepan. Continue to whisk for approximately 2 minutes. Mixture will thicken a little more. Add butter and whisk until melted. Add lemon zest and lemon juice and continue to whisk until completely combined. Remove from heat and immediately pour the hot filling into the pie crust. Scoop meringue onto pie filling and spread to cover, making sure the meringue touches the crust i.e. sealing the filling. Allow pie to cool completely before serving. After cooled, I would recommend chilling for a few hours.